A very short post on a Wednesday! Lol! I have nothing to show you - I sat down to make a card this afternoon and came up with something so awful that I've not even showed it to H or Grandad! I think my mojo has left me! I shall try again tomorrow and fingers crossed I'll be fine. No interesting mail today unless you think 2 sheets of EZ Mount is exciting! I'll leave you with this question - how many cats can you fit in one cardboard box? I'm instituting a new tradition on my blog - Cute Cat Wednesday! I'm sure I saw something similar somewhere years ago but I can't for the life of me remember where! I've spent most of today carrying on with my circle journal - covers are cut & covered, pages are cut, fairies drawn & coloured in, printer inks run out - yep, right in the middle of doing the bits I need to print out so I can send it off on its journey tomorrow! Have just bought some replacement cartridges and the chap is going to post them tomorrow so they arrive Saturday. I can't remember if we get post on Good Friday - I don't think we do but nothing would surprise me just now! Anyway, here's the cute cat pic! Back to cards & whatnot tomorrow - oh and Grandad said thanks for the comments! to write much! I bought a Cricut Expression today! And I haven't told 'he who must not know how much I spend on stash but thinks it's a lot less than it really is' yet! Oh dear.....I have wanted one since they came out and today I decided to just go for it! We may be eating baked beans on toast for the rest of the year! Well and truly blown the stash diet now! Think I may need to look at my rules again. In other news I finished the great sort out - I now have most of my papers, bazzill, embellies and card blanks in proper boxes & not just a great stack of pizza boxes. I made a start on 2 cards after I finished up but didn't have enough time to get them done before Casualty started. 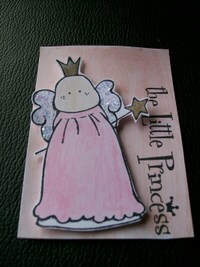 I must get on with my Fairy Tales circle journal tomorrow - first posting in 5 days! I'll leave you with a pic of 2 of the mogs using my wheelchair as a bed! New ATC & the Puma! The new challenge is up over on the Tilda & Friends ATC challenge blog so I got making mine straight away! Sad I know but I cut a whole stack of blanks after doing the Sugar Nellie ATC swap over on UKS - must have known I was going to use them up! Anyway, here is my In The Pink ATC - Princess Tilda stamp colored in with Prisma's and Twinkling H2O background. I stupidly took a photo before I put the finishing touch on the corner that looks a little bare but it got too dark to take another pic! He's sat on top of the big gate at the side of our house - one of his favorite places to snooze in the summer! And that's for certain! It's freezing - temperatures must have plummeted last night and we woke up to a frost so heavy it looks like we've had snow! Only ones brave enough to go outside so far this morning are myself - taking photos - and PumaCat! 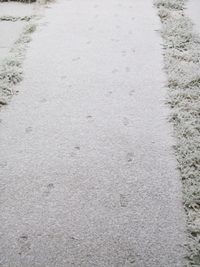 He's the whole reason I was outside taking pics as he left a trail of little paw prints all the way down the drive! Lol! Yep, I'm nearly there - managed to get quite a bit done today. One shelf is now 99% how I want it, my blossom kits are all hanging up and I've finally put the magazine files to gether so I can sort out my huge mounds of mags! Another shelf is partially done, starting with cook book corner! Much easier having all my recipe books in one place - especially when doing my recipe cards :) Got my Cuttlebug & my Zyron out of their boxes, need to track down all my dies and then get a storage box purely for the dies! DH made a fab discovery under the bed yesterday - he found my metal boxes that I bought in IKEA so I've chucked them in my scrap room too! Stash diet still going really well - have not been very tempted yet but am wavering over the new Basic Grey and the luscious new Dream Street Papers that Rebecca sells! I will be strong - am very chuffed that I've not spent anything 8 days into February but I might have to soon, need a new brown ink pad & a grey one too! Since coming out of hospital i seem to have discovered my love of cooking again. My friend Tash pointed out that she thinks it's because i'm now skinny (eeeeeeek! )(undiagnosed overactive thy*roid) and want to feed other people. I still haven't got my appetite back but i made my old favorite of grilled chicken & herb noodles for dinner today and scoffed nearly the whole plate!!! I had to leave some chicken for Princess Kittengirl otherwise she'd still be sulking now but i think that's the most i've eaten in months. I managed to dig out my copy of Domestic Goddess today as Grandad has been asking for her Steak & Kidney pudding for weeks (not that i eat it - i can't stand kidney, it was bad enough when they made me eat liver!!!) Also got Rick Stein's French Odyssey from the library as they've just shown the tv programme on UKTV Food and GD thoroughly enjoyed it - still not going to buy foie gras in this house though. Spent most of the day trying to find a skip company - they seem to be very thin on the ground round here. Finally found one that gave me a reasonable quote, fingers crossed it should be here next Wednesday. The best thing about it though is that my lovely Mum has offered to lend us the money for it - she knows things are a bit tight just now and told me to pay her back when dh finds a new job. 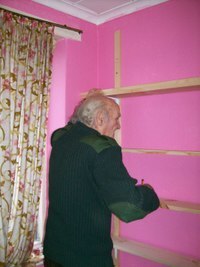 Grandad measured up for the wood today - i've decided to have one wall of shelves running the full length of the wall from floor to ceiling, and on the opposite wall, shelves slightly shorter and starting a bit higher up. I'm hoping that we should be able to get most of the books from our bedroom on them, and it will be fab to be able to go to sleep at night in a bedroom that doesn't resemble a library store room :) He's also offered to put in a couple of shelves above where my scrapping table will be, which will come in handy for all my scrapping books and little bits & pieces. Now the room is empty we've been leaving the window open in there - was nearly impossible to get to it before, never mind open it! Anyway, this morning i went in to open the curtains and got the shock of my life - cat no. 4 perched up on the window sill!!! Not that bad i know but she's such a tiny cat she can just about fit through the gap. Of course i had to dash off and get the camera, so here's a pic :) It's a bit poor as i couldn't get round the sun streaming through the window. If you click on the pic to enlarge it, it'll give you an idea of just how precarious she looks! Off to bed now to dream about tins of paint and colour charts - i may have decided on pink but i can't decide on what shade of pink! I seem to have a lot of these lately, i'm hoping i'll perk up again in the new year as i'm getting absolutely nothing done!! Today for example, i've stalked the cats to take photos - until the batteries ran out and i don't have any to replace them :( , made a large pot of chilli, got out my current cj, looked at it & then put it away in a state of panic as i don't have a clue what to do, read half of Danse Macabre and surfed the web! Productive day i think not!! I did get my inks out to start making the cover for my book journal only to find i have no glossy card left and i have specific ideas on what i want to do so nothing else will work :( Also wanted to make a start on my house book but of course i didn't do that either, i need a serious kick up the Khyber as my mother would say!!! Anyway, i shall leave you with a pic of cat no. 3 who likes to jump on my chair as soon as i get up and refuses to move without a fight!